Home › Creating › Sewing › Swish! 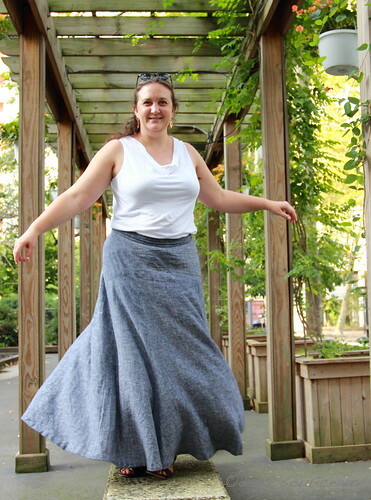 I’ve loved the Gabriola skirt by Sewhaolic Patterns ever since it came out but since it requires a lot of fabric, it had been waiting. I finally made it this Spring. I bought two shades of the rayon-linen blend that I used for my dress. 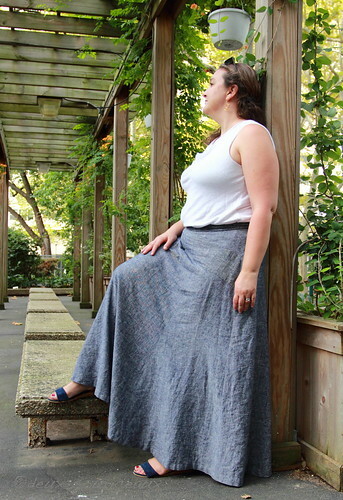 I picked the navy for the dress and had this denim-y color for the skirt. It’s woven dark blue and white, like denim but in a plain weave instead of a twill. I thought the drape of the fabric would be a good match for the pattern. I don’t remember what size I made, except that it was a straight size. I usually grade down a size at the hips with Sewaholic since their block has bigger hips. In this case, there was already so much ease at the hips that I figured it didn’t matter. In retrospect, I think it might look better with some of the ease taken in at the hips. Now that I understand how the pattern goes together, I think it would be easy to alter. 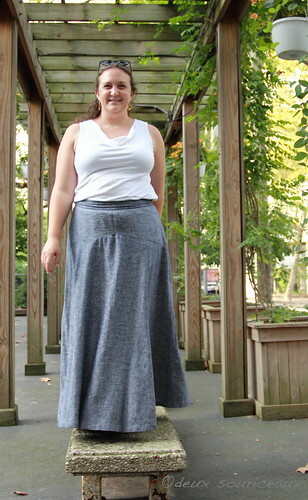 I’d read that this skirt was long but It’s even longer than I thought it would be. Shortening it is hard because of the flare. I had a hard time adjusting the sides after slashing and overlapping. If I were to redo it, I would slash in 2 or 3 spots and even reduce from the hem to keep the original flare proportions. Sewing was pretty easy except in one spot. I had a hard time with the center front of the skirt with that point. I didn’t get it perfect so it’s a little curved and wrinkly. Or maybe I should learn to sew points. Got any tips? Oh, and tips on interfacing? My waistbands keep crumpling up. I’d like them to stay still but remain comfortable. I have a feeling I’ll have to pick one or the other. I love this! That fabric has the perfect sort of drape for that pattern! I haven’t figured out the solution to waistbands either- a lot of people swear by petersham at the waist, but I don’t think I’ve ever heard of it being enclosed in the waistband. I love these photos too! Thank you! I’ve noticed my ready-to-wear shorts and pants do the same thing. I need to research this a bit.